Skipper Shahid Afridi led from the front with a scintillating five-wicket haul to help Pakistan notch up a 46-run victory over Canada in a Group A World Cup match in Colombo on Thursday. Inspired by Afridi's exploits, Pakistan shot out Canada for 138 in 42.5 overs after folding for 184, batting first, at the R Premadasa Stadium. Chasing 185 to win, Canada were off to a disastrous start as they slipped to 44 for three in 17.1 overs. Zubin Surkari (27) and Jimmy Hansra (43) added a fighting 60-run partnership to lift Canada to 104. But Canada couldn't go all out for the chase and steamrolled by Afridi & Co. Earlier, Canada had conjured up hopes of an upset when their bowlers bowled out the former champions Pakistan for 184 in their World Cup group A match. Pakistan found the disciplined Canada attack to hot to handle as, after opting to bat, they lost wickets at regular intervals to be finally bundled out inside the 200-run mark in 43 overs. If not for the 73-run fifth wicket stand between Misbah-ul-Haq (37) and Umar Akmal (48), Pakistan could have folded up for a lesser total as they lost their last six wickets for just 44 runs. India-born medium-pacer Harvir Baidwan was the pick of the Canada bowlers with figures of three for 35 runs while Hansra (2/23), Cheema (2/33) and Rao (2/50) snared two wickets apiece to spell Pakistan's doom. Pakistan were off to a shaky start as they lost their first four batsmen for just 67 runs after electing to bat. Opener Mohammad Hafeez started positively as he picked up Henry Osinde for special treatment in his first and second over, spanking the right-arm pacer for back-to-back boundaries. But Osinde got his revenge in the first delivery of his next over, trapping Hafeez lbw but not before the batsman went for the review which went against him. Baidwan struck the second blow for Canada in the ninth over, dismissing Ahmed Shehzad caught by Gordon at mid-on. Baidwan then trapped Younis Khan lbw in the 13th over with a full length delivery that was titlting in towards middle and leg, prompting the batsman to go for another unsuccessful review. Two overs later, Kamran Akmal too departed caught at the backward point region by Nitish Kumar off Cheema to ensure a dream start for Canada. 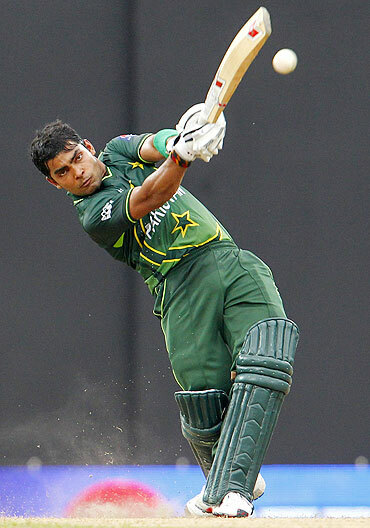 But then came in ever-reliable Misbah and together with young Umar Akmal, he steadied the rocking Pakistani ship with the 73-run stand. After the shocking start, the duo took their time to settle in as they mostly dealt with ones and twos with occasional boundaries in between during their 117-ball partnership. But after all the hardwork when it was time for Misbah and Umar Akmal to accelerate, leg-spinner Rao inflicted twin blows, dismissing both the set batsmen with the Pakistan scoreboard reading 165 for six. 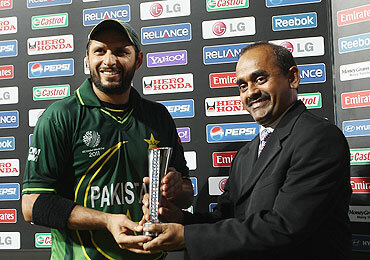 Then, captain Afridi (20) decided to step on the pedal to help his team reach a respectable total. Afridi slammed two boundaries but his plans were destroyed by the Canadian bowlers. He became Cheema's third victim. 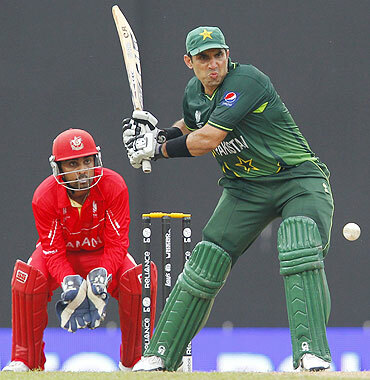 All-rounder Abdul Razzaq also failed to live up to his reputation managing to make only eight runs in as many deliveries. The lower-order did very little to help Pakistan's cause as they lost their last four batsmen within a span of three runs. After failing with the bat, Afridi made amends with the ball, picking 5 for 23. The Pakistan captain, who grabbed 5-16 and 4-34 against Kenya and Sri Lanka respectively in their last two matches, became the first bowler to take three consecutive four-wicket hauls in World Cup history. Apart from dismissing Ashish Bagai (16), Jimmy Hansra (43), Rizwan Cheema (4), Tyson Gordon (9) and Harvir Baidwan (0) in his 10 overs, Afridi also produced a brilliant direct throw to sent back Balaji Rao at the fag end of the match. Zubin Surkari (27) and Jimmy Hansra (43) added a fighting 60-run partnership to lift Canada to 104. But with Saeed Ajmal trapping Surkari in front of wicket in the 34th over and Afridi taking two wickets in consecutive deliveries meant Pakistan was back in the game. Afridi first sent Rizwan Cheema's off stump for a walk with his googly and then disturbed HS Baidwan's woods with his quick ripper to reduce Canada to 114 for seven. The skipper returned again to dismiss TG Gordon with Wahab Riwaz taking a superb catch to complete his second five wicket haul in Colombo.